Comfortable home, recently renovated while maintaining the atmosphere of the past, included in a geographical context quiet and relaxing just 5 minutes drive from the sea. It has two apartments, a studio and a room equipped with kitchenette, equipped with every comfort, terrace overlooking the sea and mountains with table and chairs outside, large bathroom with shower, independent entrance, TV, washing machine use, bicycles available. The location of the house is in Badolato, a charming medieval village, a small crib overlooking the Gulf of Squillace, with fourteen churches arranged in the shape of a Latin cross and many alleys characteristic, which rises 240 meters above sea level, on a hill. Is only 7 kilometers from the white beaches and 5 km from the mountain. 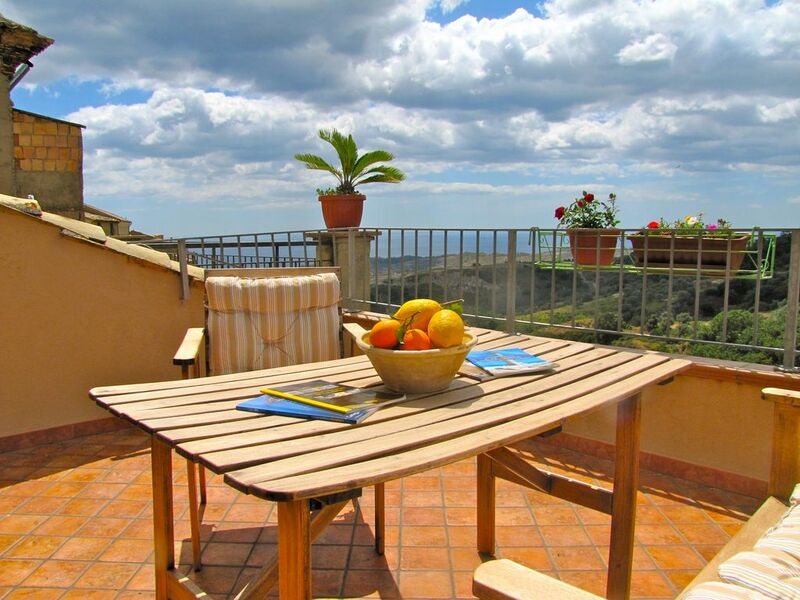 Special Holidays in the Heart of beautiful Calabrian, in the Middle of Mediterranean Sea, old Village and Wild Montains. By Casa Vacanza B&B Santa Barbara and Riviera Borghi Degli Angeli. Special May / June 2016. Location 2/4 people from € 220 for 7 nights with Free transfer to and from Airport. Car rental scooter on site. "Very nice and hospitable family. Nice apartments in a stone house with everything you can need inside. Breathtaking view from the terrace on the sea, olive groves, hills. You will never forget this view!" Het ruime appartement ligt aan de rand van de mooie borgo Badolato, weg van de drukte aan de kust. In oktober was het heel rustig, maar ook in de zomer als het veel drukker is , is dit een prima plek om te verblijven. We werden erg gastvrij ontvangen en de eigenaren organiseerden ook activiteiten om aan deel te nemen. Het appartement heeft een mooi terras met een prachtig uitzicht. Wir haben eine Woche in dem Studio des Hauses in der zweiten Etage verbracht. Super Dachterasse, nette Vermieter, geschmackvoll eingerichtet. Das Stuido war sehr sauber. Es gab frische Handtücher und Bettwäsche. Die Ausstattung der Küche ist leider sehr übersichtlich. Da sollte nachgerüstet werden.Badolato ist ein hübsches Dorf. sehr netter Vermieter, super Aussicht, wir kommen wieder! Grazie Sebastian è stato un piacere avervi conosciuto e avervi ospiti a Badolato. Badalato, ein 1000 Jahre altes Bergdorf mit traumhafter Kulisse. Vom Balkon Blick über die Landschaft bis zum Meer und nahezu den ganzen Tag Sonne. Hübsch restaurierte Wohnung und eigener Parkplatz. waren menschenleer und selbst Ende Oktober war das Wasser noch angenehm. Leider waren die Lokale in Badalato zu der Zeit schon geschlossen und man musste jeweils die etwa 15minütige Fahrt zur Marina in Kauf nehmen. wären eine Bitte an Angela. The apartment has everything you need for a few days of vacation. Nice patio with a good view. It is a really quiet place though, not much stores or restaurants in the village. Motorwai Salerno - Reggio Calabria ex it Lamezia Terme, follow direction Catanzaro at the junction of Germaneto follow sig.na Soverato - Reggio Calabria ( S.S. 106 ). International Airport of Lamezia Terme ( www.sacal.it ). Trenitalia stationery of Lamezia Terme - Badolato Marine. Tariffe scontate in relazione alla durata, Tariffe in funzione del numero di persone, Richiesto supplemento per il riscaldamento in base alla stagione, Caparra richiesta alla prenotazione, Consegna delle chiavi da parte del Proprietario presente in locorietario. SCONTO DEL 20% per il mese di GIUGNO E SETTEMBRE. Le tarriffe riportate si intendono per appartamento.